Note: This is an absinthe microdistilled by Great Lake Distilling, who also make a red (Rouge) version flavored with Hibiscus along with some lovely gins,vodkas and specialty spirits, a number of which we have reviewed previously. 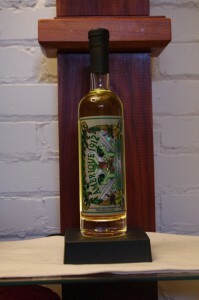 As a side note this absinthe uses a in house distilled grain base. First Impression: Wormwood, fennel, anise, slightly minty and herbal notes (hyssop?) Very nicely balanced and harmonious. Appearance: Clear, bright, proper green chlorophyll color of stunning clarity. It will however turn the color of fallen leaves (there is a specific French term for this that I forget at the moment) with age and maturity. On swirling, leaves a thin coat on the glass with scalloping and very thin legs developing. Taste: Full strength it is quite drinkable for its’ proof- which is another show of its quality – even if I don’t recommend the practice. We try everything at original strength here so you don’t have to! Properly diluted (3 to 5 parts water to 1 part according to taste) the anise and wormwood play nicely with the hyssop. It does not overly coat and deaden the tongue like many other absinthes but leaves a slightly sweet anise and herbal, fresh grass finish. Similar to its red brother in that I find it is in some ways much more of a the Provence pastis style rather than a heavier absinthe. Well made and and charming if not the most complex we have had . I personally don’t think you need sugar with this one – it would dumb down the taste. Drinks: The French absinthe ritual involves water fountains, sugar, spoons, and you pour the absinthe in the glass, then put the spoon over the glass put a sugar cube on it and drip water from a purpose built fountain over until it louches (opalesces, turns cloudy, etc.) and the right amount of dilution (to personal taste-variable) is reached. There are a number of web sites that show you how (check our Absinthe Links section) and to get all your gear check La Maison d’ Absinthe or Kegworks. For other drinks such as a Death in the Afternoon, or a Sazerac, it mixes wonderfully and the red coloration adds some nice eye appeal. Bottle: Clear glass brandy or eau de vie bottle with heavy bottom making it hard to tip over and Lovely art nouveau style label is oriented horizontally rather than the standard vertical orientation to enable the label to be bigger and uses reflective ink to give it the lurid depth of color that chromolithography could render but that can no longer be accomplished with today’s standard printing techniques. Black neckwrap and a composite cork with a black top finish the package. Final Thoughts: Distillation is excellent and the flavoring shows a light but deft hand. Great price ( especially when you consider this is 126 proof ) and another point is the 375 ml bottle so you can try it without committing to major money and having a lot of absinthe in your bar. Highly recommend as a starter artisanal absinthe or for the jaded as something refreshingly light and different.